"Dishes. Relationships. Wind. This guy breaks everything." A generation ago the film Drop Dead Fred (1991) made us all laugh and sigh. Now, of course, there is a new crop of film lovers to enjoy DDF. The story line centers around a young Seattle woman, Elizabeth (played by Phoebe Cates) whose husband has wandered and she is emotionally retreating. Her husband Charles (played by Tim Matheson) is the subject of Elizabeth's efforts at reconciliation. As the film unfolds her efforts happily fail. While retreating she becomes plagued by the return of her childhood imaginary friend named, Drop Dead Fred. Fred (played by Rik Mayall) has been locked up inside a jack-in-the-box toy since Elizabeth's mother duck taped it shut about twenty years before. Needless to say, Fred was incarcerated for a reason. Actually, many reasons got him locked away. Now that Snotface (Fred's name for her) is home again with her mother, Polly (played by Marsha Mason), she assumes the role that she had as a child. She was herself a product of a marriage which was in the process of breaking up when her imaginary friend, Drop Dead Fred, arrived. The film features fun antics with an awfully cleaver collection of sight gags. Fred is at the center of many embarrassing and difficult mishaps which are presented in interesting special effects. The setting is a delight in itself as Seattle's coast, downtown and suburbs are attractive backgrounds. This is in direct contrast to Fred's disastrous messes which were blamed on the young Elizabeth in flashbacks. Unfortunately, these continued when he returned to plague her as an adult. Fred wreaks havoc at Polly's house, Elizabeth's best friend, Janie's (played by Carrie Fischer) houseboat, a psychiatrist's office and Janie's workplace. Things work out for the best as Elizabeth regains her equilibrium and begins a relationship with a man she knew from childhood. Mickey Bunce (played by Ron Eldard) helps Elizabeth to come back to reality. She believes that her prescription medications have helped her to forget Fred. But Mickey has a young daughter who tells of her encounter with someone named Drop Dead Fred and Elizabeth is once again convinced that he is real. 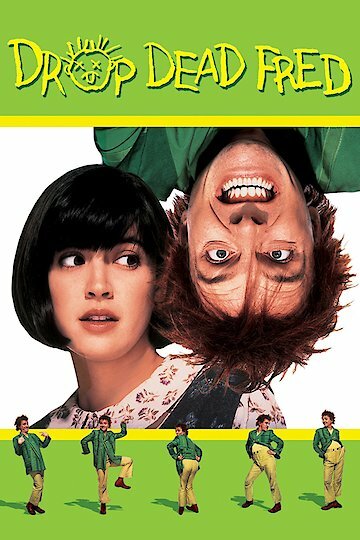 Drop Dead Fred is remembered by those who saw it as a new release to be a funny and popular film. It seems to have made less income than others of its time, however. Regardless of those early box office proceeds it is certainty a classic. Drop Dead Fred is currently available to watch and stream, download, buy on demand at Amazon Prime, Starz, Amazon, Vudu, Google Play, iTunes, YouTube VOD online.